Get hooked-on potholders, whether it's to brighten up your own kitchen or make as a gift, there are patterns for all tastes and seasons. Crochet is popping up everywhere, crochet lovers will enjoy using their left over yarn stash to create these beautiful colorful potholders. Even in the most modern kitchen you need potholders, they are simply essential. With over 25 inspiring, fun-to-crochet patterns in this book, let your imagination run wild as you play with colors and designs. All projects are shown with full-color, close-up photography, and with any necessary diagrams or charts. 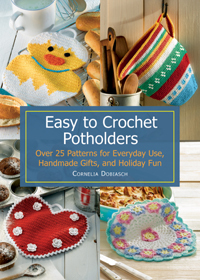 An ideal book for crocheters on all skill levels. CORNELIA DOBIASCH is an artist of needlecrafts such as crochet, knitting, and sewing. She likes to create new ideas with all sorts of needles, yarn and fabric. These wonderful crochet potholders are some of them. Cornelia Dobiasch lives in Luckenwalde, Germany.